Many people often wonder how much of their income they should spend on their home, vehicle, groceries, clothes, etc. Below are some guidelines to give you a general idea and provide you with a starting point for your budget. Based on your income, family circumstances, and the part of the country you live in, your allocations may be very different. To use these budgeting guidelines, start by developing your budget with the money you have available after government deductions from your pay cheque, but before voluntary deductions like RRSPs, pensions or other savings. If you have expenses such as high debt payments, childcare, school expenses or giving, you will need to reduce your spending in other areas to accommodate these higher expenses. Many people find that their budget is quite tight because their monthly debt payments are closer to 25% of their net income. These guidelines are designed for someone who really needs to put together a tight budget. If finances aren't strained in your household, you can choose to be more relaxed and exceed the guidelines in areas as long as you're doing two things: 1) you're not spending more than you earn, and 2) you're allocating some money towards savings (savings are absolutely necessary for life's many unexpected expenses. Don't rely on credit for these unexpected expenses. Rely on money you've saved). The category in these guidelines that people will most commonly exceed is the Personal & Discretionary expense category. The guidelines suggest you spend 5 - 10% of your income in this category. However, if you have young children in daycare, take nice vacations, tithe, or have hobbies or recreational interests that aren't cheap, you'll quickly exceed the suggested maximum for this category. Please know there is nothing wrong with exceeding this limit as long as your budget balances (your expenses don't exceed your income). You may also notice that if you spend the maximum amount in every category, you'll exceed 100% of your income. The guidelines are only recommended ranges. Life is all about choices, but you can't choose the maximum amount in all spending categories. Spending more in one category may mean that you'll have to cut back in another category to make your budget balance. If you live in Canada's far north or in a city with extremely high home values, you may have to cut back more than an average Canadian would in certain categories in order to afford your higher living costs. In these cases, you will most likely exceed the suggested maximum guidelines for Food (if you live in the North) or Housing (if you live in Toronto or Vancouver). To make budgeting easier, we've now built these budgeting guidelines into an Excel Budgeting Calculator Spreadsheet. As you enter your living expenses, the interactive spreadsheet will calculate all the guideline numbers for you. It also visually compares your spending in each category to these guidelines so that you can see how you're doing. As you fill out the budget spreadsheet with your living expenses, it warns you if you are exceeding the guidelines in any area of your budget, and visually shows you how your spending falls into these guidelines. 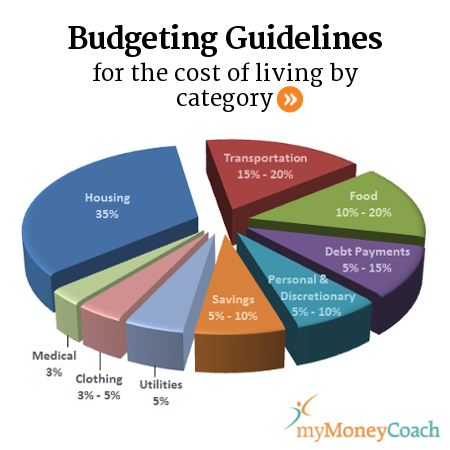 It basically guides you through the process of creating a budget and suggests spending amounts for every budgeting category listed above based on your income and family size. 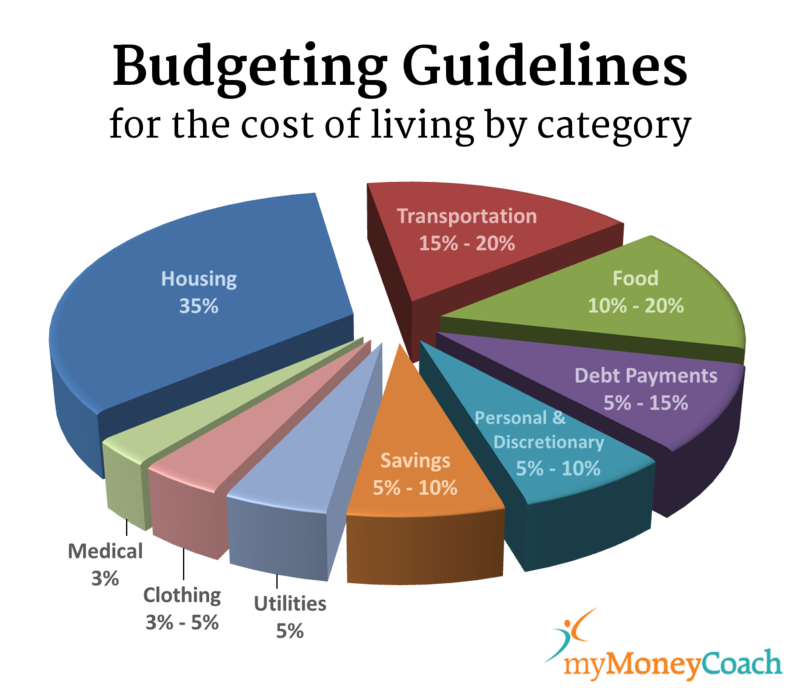 When you're done, it also shows you what your budget looks like in a pie chart divided into the nine categories listed above. 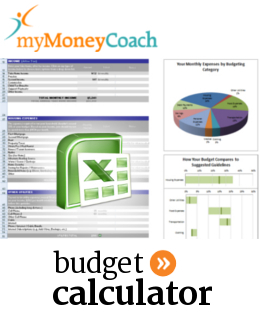 Check out the new Budget Calculator for yourself! It's free and easy to use - even if you've never used Excel before. You can also download it for Numbers on the Mac and OpenOffice (free open source office software) if you don't have Excel on your computer. If your income fluctuates, creating a budget with irregular income can be hard. To make things easier, try working with one of these 3 strategies for creating a personal budget plan with irregular income. You can also learn how to plan for and budget with irregular income in one of our free online workshops.